HCO’s annual musical was established in 1998. While the yearly production acts as a fundraiser to assist us providing much needed services, supplies, and equipment for those we support, its uniquely designed to promote the inclusion of individuals with disabilities into our daily lives – the centralized goal of HCO’s organizational mission. Over the years, they have become a part of local community life and bring together some of the strongest talent in the Winona area. By providing a quality musical production that integrates individuals with disabilities into the performing arts, HCO continues its efforts to enhance life in our community for all. For more information on how to get involved in this amazing project, check out the musical section of our website! The Little Mermaid cast list is complete! Thank you to everyone who took the time to try out for this year’s musical! Casting decisions were difficult this year due to the incredible talent that came through our doors. If you do not find yourself on this list, we hope you will consider participating in other ways, be it as an usher or backstage volunteer, and please return to audition next year. Each show brings it own unique casting needs. Please note that some of the sailors, maids, chefs and gulls may be added to the chorus numbers. If there are any individuals cast that would like to decline their role, please email hcoproduction@gmail.com. We thank each and every one of you for your interest in being a part of the mission and work of HCO. Be a star with Home and Community Options 2018 summer musical production! This is your call to audition for Disney’s THE LITTLE MERMAID. Come join the fantastical musical adventure! 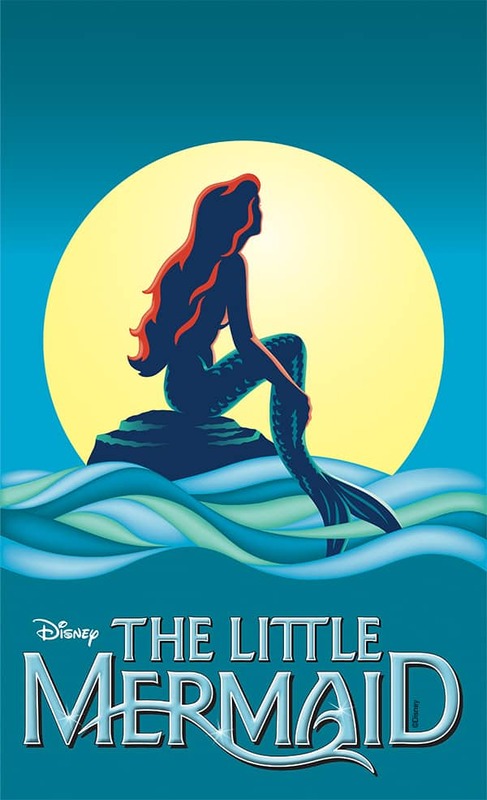 Based on the Danish fairy tale of the same name by Hans Christian Andersen, THE LITTLE MERMAID tells the story of a mermaid princess who dreams of becoming human. There will be roles for 60 people, including numerous children’s roles for ages 8 and up. All auditions will take place from 6:00 p.m. to 8:00 p.m. at Home and Community Options Central Office at 66 East Third Street in Winona. On Monday, April 9th, auditions will be held for children ages 8 to 14. On Tuesday and Wednesday, April 10th and 11th, auditions will be held for persons 15 and older. 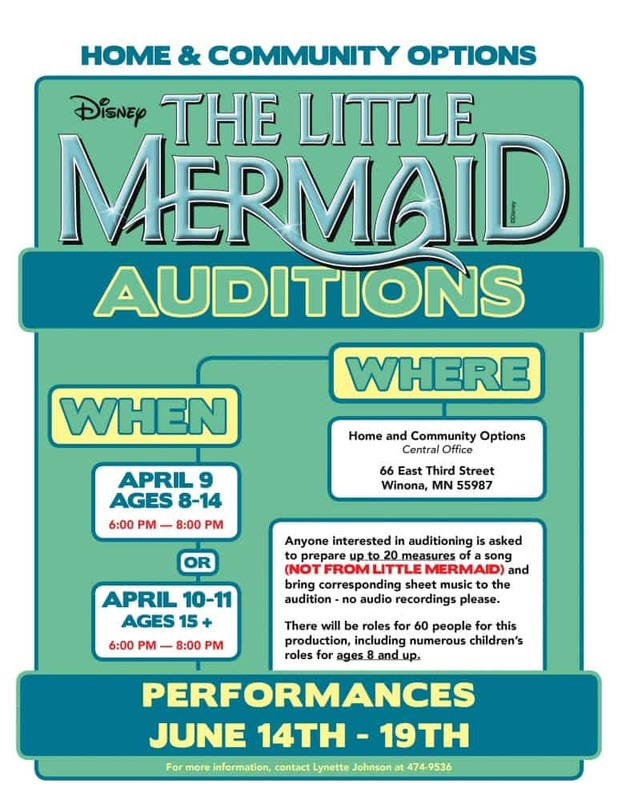 Anyone interested in auditioning is asked to prepare up to 20 measures of a song (NOT FROM THE LITTLE MERMAID) and bring corresponding sheet music to the audition–no audio recordings please. Performances will take place from June 14th through June 19th at Saint Mary’s University Page Theatre in Winona. Money raised by this event will help support Home and Community Options mission of serving children and adults with developmental disabilities who are in need of residential and support services in order to live happily in the community. For further information please contact Lynette Johnson at 507-474-9536. Home and Community Options’ 20th summer musical, “Chitty Chitty Bang Bang,” played to sold-out crowds again this year, and HCO is so proud to have been able to bring some wonderful new elements to another fantastic production. Home and Community Options’ mission is to provide support and residential services to people with disabilities so they may live as full members of our community. Two hundred and fifty of our HCO consumers are living valued lives in our area, and 74 of these HCO friends contributed their unique talents by involvement onstage, backstage, and through artwork displayed in the lobby. 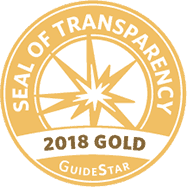 This year’s show really proved that “teamwork CAN make a dream work!” An enormous thank you to all those that continue to make our productions successful: the financial contributions of our sponsors, and the talented efforts and long hours of the actors, orchestra, and behind-the-scenes crews. Thanks to the set builders, the costumers, the directors and choreographer, the volunteers, and St. Mary’s University for another year of providing an amazing venue for our cast and community to enjoy! The Chitty cast list is complete! Thank you to everyone who took the time to try out for this year’s musical! Casting decisions were difficult this year due to the incredible talent that came through our doors. If you do not find yourself on this list, we hope you will consider participating in other ways, be it as an usher or backstage volunteer, and please return to audition next year. Each show brings it own unique casting needs. Please make sure to scroll through the entire list as some individuals may be listed in more than one category. Be a star with Home and Community Options 2017 summer musical production! 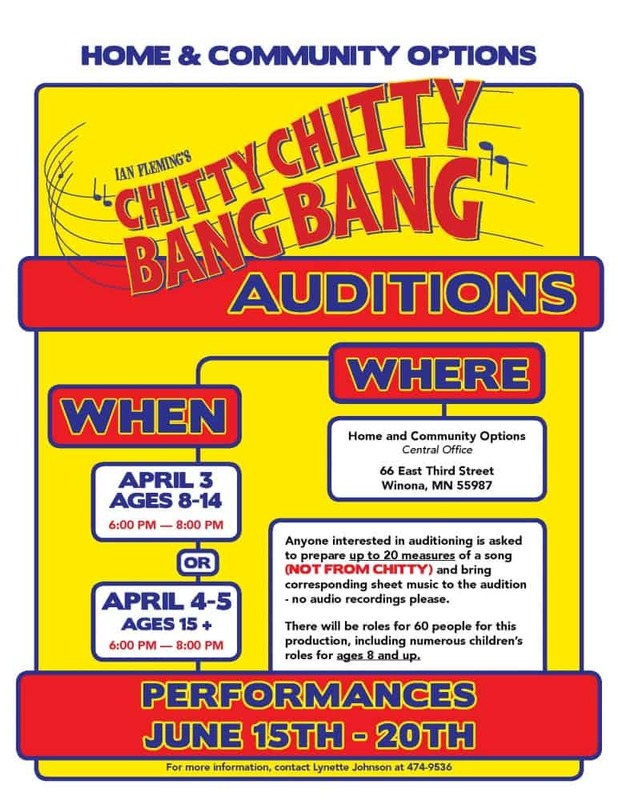 This is your call to audition for CHITTY CHITTY BANG BANG, which is based on the book and lyrics by David Lindsey-Abaire and music by Jeanine Tesori. From Music Theatre International, Chitty is “a high-flying, fun-filled adventure for the entire family. Based on the beloved 1968 film version of Ian Fleming’s children’s book, and featuring an unforgettable score by the Sherman Brothers (Mary Poppins), Chitty Chitty Bang Bang is one family-friendly blockbuster that audiences will find Truly Scrumptious.” Home and Community Options wants you to be a part of it! There will be roles for 60 people, including numerous children’s roles for ages 8 and up. All auditions will take place from 6:00 p.m. to 8:00 p.m. at Home and Community Options Central Office at 66 East Third Street in Winona. On Monday, April 3, auditions will be held for children ages 8 to 14. On Tuesday and Wednesday, April 4 and 5, auditions will be held for persons 15 and older. Anyone interested in auditioning is asked to prepare up to 20 measures of a song (NOT FROM CHITTY) and bring corresponding sheet music to the audition–no audio recordings please. This year’s production will be under the artistic direction of Mark Roeckers and musical direction of Dr. Harry Mechell. 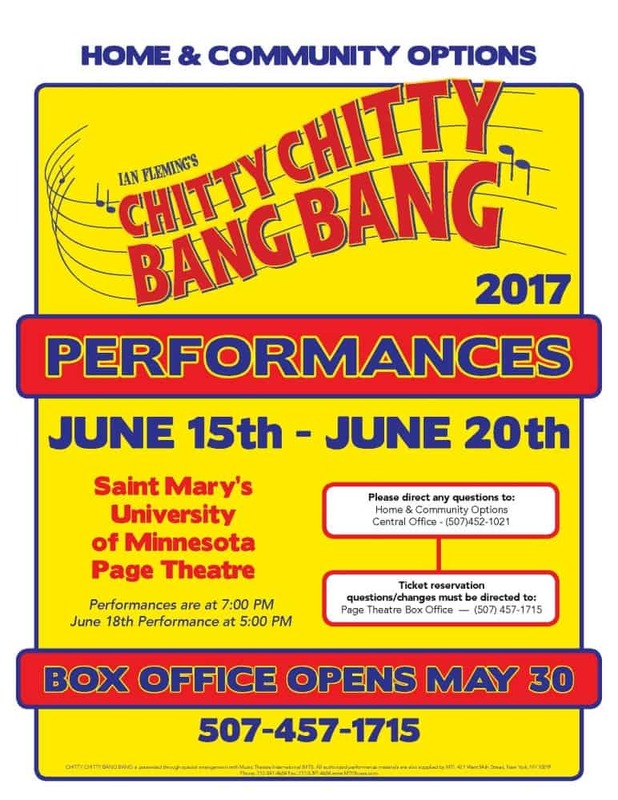 Performances will take place from June 15 through June 20 at Saint Mary’s University Page Theatre in Winona. Money raised by this event will help support Home and Community Options’ mission of serving children and adults with developmental disabilities who are in need of residential and support services in order to live happily in the community.